A colourful grocery shop at Whole Foods Kits today (post Sempervia Kundalini class with Gloria…been? Amazing!) inspired this vibrant, hearty salad. I find bright shades of produce irresistible. Today’s bounty included purple cauliflower, nasturtiums, Easter egg radishes (which come in bunches of white, purple and pink bulbs), purple green onions and the darkest red strawberries I’ve ever seen (a guilty pleasure). Here’s a rough guide to making this Black Rice and Radicchio Salad, which is vegan if you skip the egg. 1. Cook your rice according to package instructions and set aside to cool. 2. Make your dressing: play around with these ingredients to achieve desired acidity / sweetness / tanginess (I consider this the perfect multi-purpose dressing). 3. In a large bowl, combine rice, radicchio, half your black Spanish radish, one of your red radishes and a big splash of dressing — toss. 4. 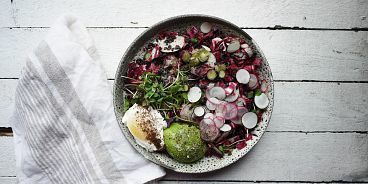 Transfer to your serving bowl and garnish with microgreens, remaining radishes and an avo / egg, if you wish. Some pumpkin seeds or peanuts could work really well here, too. Enjoy!